I’m of the opinion that one is either good at cooking eggplant or you’re not. I have long believed I am member of the latter group. While my great aunts could whip up a batch of eggplant Parmesan with their eyes closed and produce aubergine to crispy perfection. My ex-sister in-law made the very best rolled eggplant: she fried the eggplant, rolled it with ricotta then baked it. Absolutely heavenly. I have tried their recipes and sadly, failed each and every time. My eggplant was more like a sponge that cleaned up an oil spill. Needless to say, I don’t cook it much, and definitely don’t fry it. But somewhere on my internet wonderings I saw two recipes from Martha Stewart, grilled eggplant, the other stuffed tomatoes with mozzarella . Eggplant, you will be conquered damn it…and roasted. My plan was to roast the eggplant then throw roasted veggies on top. I was inspired by a beautiful video and pictures by Heart Beet Kitchen. 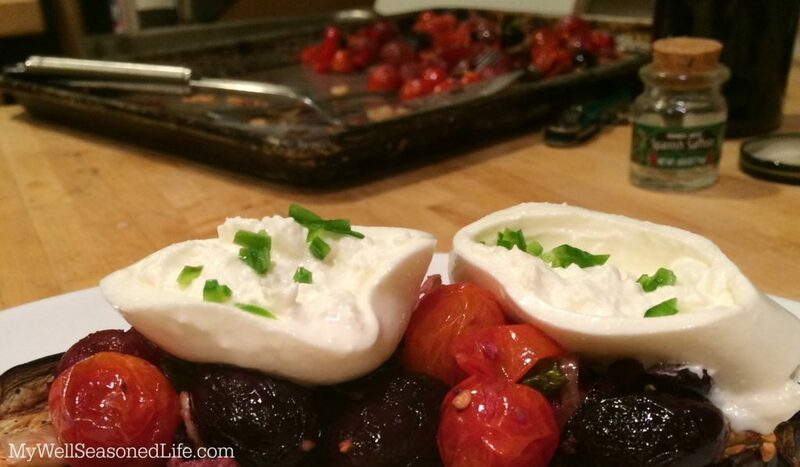 I wanted to see roasted tomatoes look that beautiful…on top of eggplant…with burrata. But I also had grapes…lots of grapes…make that a ton of grapes. I decided they were going to join the tomatoes in the oven. I know what you’re thinking roasted grapes?!?! My dinner guest was equally doubtful. 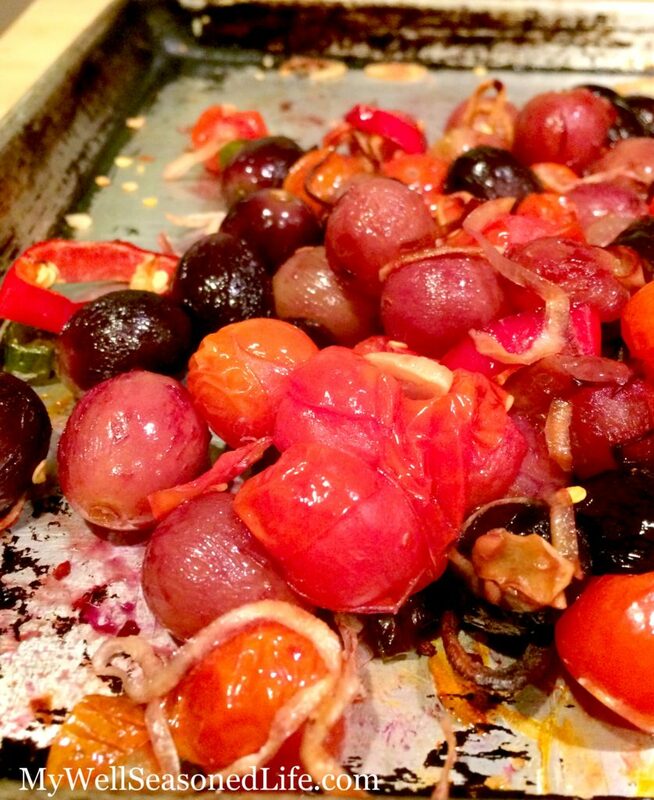 Yet, it turns out that roasted grapes are puffed up balls of sweet scrumptiousness that compliment the tomatoes. Add a handful of olives and the flavor balance is complete. Alas, when something is delicious, no matter how odd, one simply chows down. Did the eggplant survive? The roasted eggplant oozed smoky goodness and very little oil. I think my great aunts are smiling down upon me. 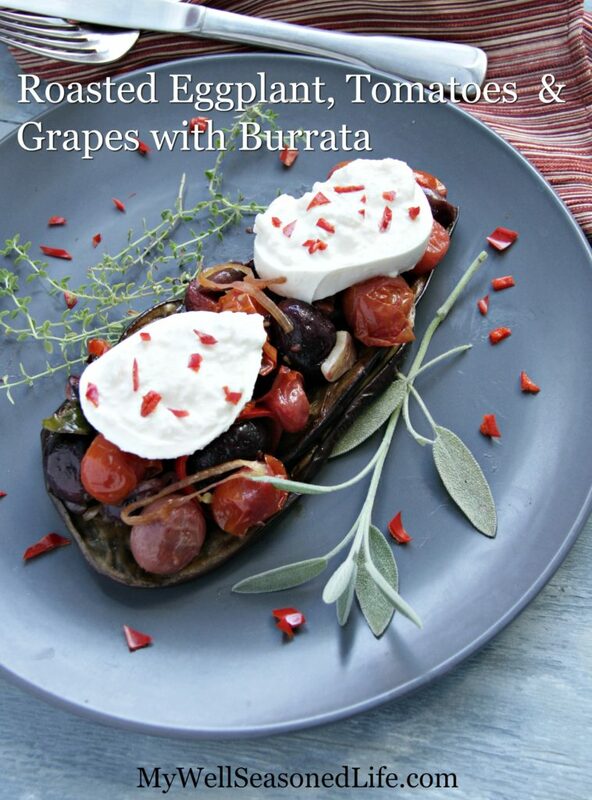 I plan to make this odd combo of roasted eggplant, tomatoes, grapes and burrata again and again. Turn oven onto 400 degrees. Sprinkle eggplant slices with a coating of salt on both sides. Place slices in a colander, put colander on top of a plate or in the sink for 30 minutes. Pour a splash of olive oil on a half sheet pan or rimmed baking tray. Dump tomatoes, grapes, shallots, garlic and peppers onto the pan, season with salt and pepper and toss with a spoon or spatula until coated with oil and seasonings. Bake for 20 minutes or until the tomatoes burst a bit. Rise off salt from eggplant slices. Place on paper towels and pat dry. Brush olive oil on both sides of the eggplant, lightly sprinkle salt and red pepper flakes. Turn the broiler on. Once up to heat, broil eggplant until brown on each side. Once the tomatoes etal are done add olive pieces and mix. Place eggplant slice on plate. Add a healthy layer of the tomato mixture. How funny, I serve burrata with eggplant as well. It makes a nice contrast to the mild, milkiness of the cheese. I love roasted grapes and this combination is a winner for me.